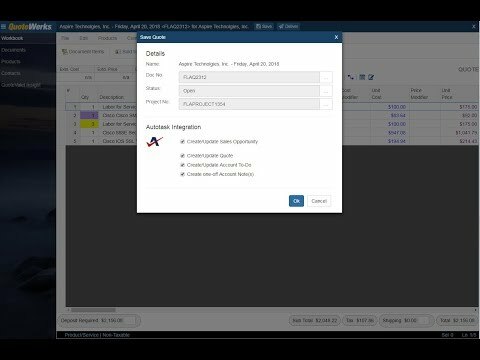 This video demonstrates the QuoteWerks integration with Autotask. Every business needs a few basic software tools to operate efficiently. In my world, it is Autotask, QuickBooks and QuoteWerks. QuoteWerks is the glue that holds it all together and lets information smoothly move between my suppliers, the tools and my customers. With QuoteWerks we deliver quotes quickly, we easily accommodate changes and present a professional image while shorten the sales cycle. 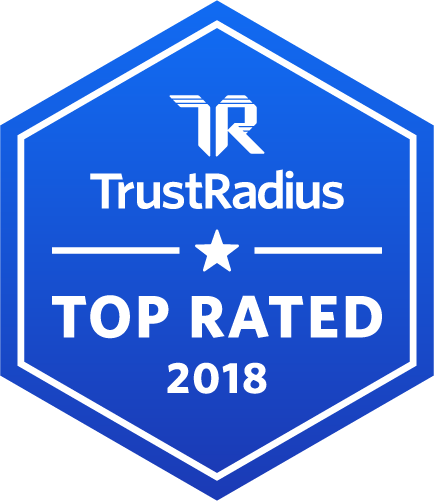 Once the client approves the quote, information flows into Autotask and QuickBooks where the project is completed / billed and the cycle is complete. Alan Helbush, President at Where To Start Inc.
QuoteWerks integrates with both Autotask Go! 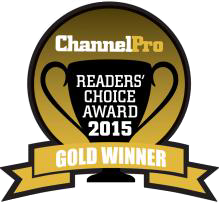 and Autotask Pro (On-Premise and Cloud). Autotask Go! does not have Opportunities or Quotes, therefore QuoteWerks can not update these in Autotask Go!. The QuoteWerks Autotask integration is only available in the Corporate Edition of QuoteWerks. From our Sold To / Ship To tab of the QuoteWerks quote workbook, you can search the Autotask database for a contact by name, account name, or phone number. QuoteWerks will fill in the contact information in the quote by pulling the contact information from the contact that you searched for. 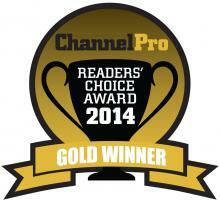 You will never have to re-type your customer information. When saving a quote, QuoteWerks automatically creates a link to the quote under the Attachments tab in the Autotask Opportunity. You can even click on the attachment and QuoteWerks will open and display the quote the attachment refers to. This feature is very useful for organizing and finding your quotes from within Autotask. If this is a remote install or satellite office, opening that document link will import that quote into that QuoteWerks installation. When saving a quote, QuoteWerks automatically creates an Opportunity in Autotask. When you are in Autotask, you will see the sales opportunities and their sale amounts for each quote you have created for this contact. The Opportunity feature is very useful in determining your projected cash flow. 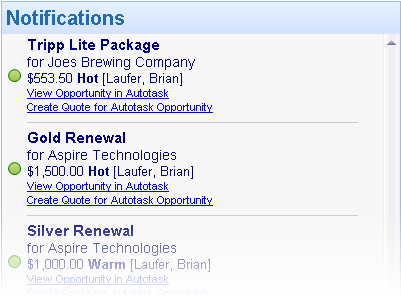 When creating or updating opportunities in Autotask, you can add file attachments to the opportunity. You can either select a file using a file selection dialog, or choose a file that is already linked to the quote under the Links tab on the Quote WorkBook. This is really useful for attaching a PDF version of the quote to the Autotask Opportunity. Having a PDF version of the quote is an advantage because anyone can then view the quote - they do not have to have QuoteWerks installed on their machine to view the quote. You can attach multiple PDF files to the opportunity, so you can easily attach the customer proposal, and a no frills plain vanilla version for the service technicians to follow, and basically anything else you could want. When saving a quote, QuoteWerks can create an Autotask Quote associated with the Opportunity. Line item detail from the QuoteWerks Quote will automatically transfer to the Autotask Quote including recurring revenue details. When you select the Autotask contact to use in the quote, our innovative DataLink feature can automatically pull other information from Autotask into the quote such as sales tax, customer terms, customer profile, shipping method, etc. 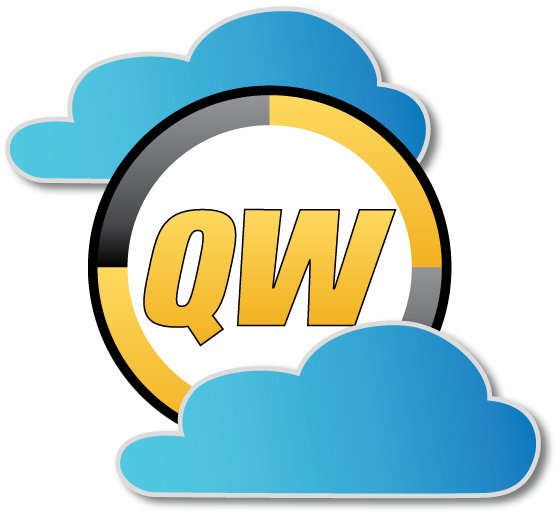 Customer profiles can be used by QuoteWerks to determine the appropriate pricing a particular customer should receive. The Autotask DataLink is bi-directional, so field information can be copied from QuoteWerks into the Autotask opportunity and then fields can also be copied from the Autotask Opportunity into QuoteWerks. 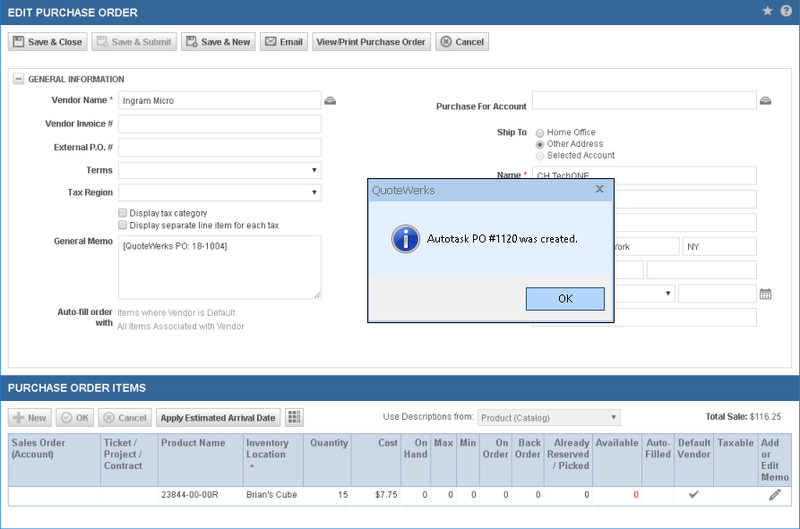 QuoteWerks can easily create Autotask Purchase Orders that contain items from a single or multiple orders. Items that do not exist in Autotask will be created. Additionally if using the Online Ordering feature of the real-time module, after the items are ordered you will be asked if you want to create a Purchase Order in Autotask for the items you just ordered electronically. The Autotask Purchasing Module is required to use this feature. If you do not have the Autotask Purchasing Module, QuoteWerks can create POs in QuickBooks. 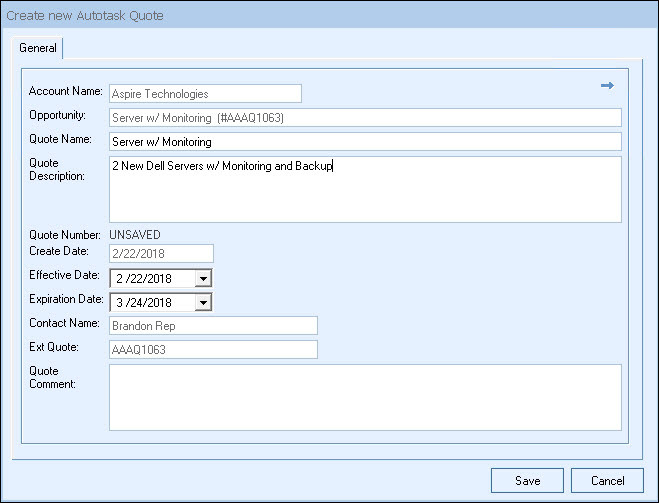 When creating Quotes in Autotask, those products will be created in the Autotask products databases for future use if the item does not already exist in Autotask. In fact, you can even use this feature to completely populate your Autotask product database (effectively importing products into Autotask) with products from QuoteWerks product databases or your QuickBooks items list. 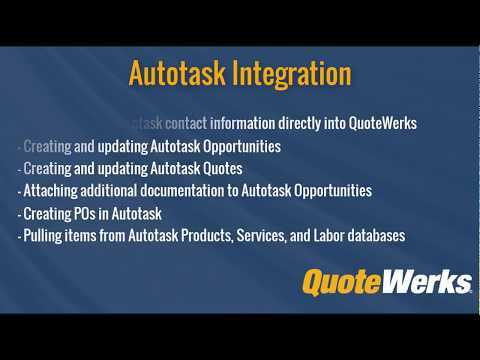 QuoteWerks enables you to use the products, services, and Labor Items you already have in Autotask. QuoteWerks can link to the Autotask Products and/or Services databases as Product Data Sources. From within QuoteWerks, you can search the Autotask databases and add these products and services to your QuoteWerks quote. From within QuoteWerks, you can enter a new lead in the quote and simply click on a button to create that company and contact in Autotask. From the My Summary Dashboard in QuoteWerks, you will see all Opportunities in Autotask that need a Quote created. This feature was designed so people on the road using Autotask can enter basic specifications for the Autotask opportunity. Then, in the office, the person assigned to create quotes will automatically be notified that s/he needs to create a quote for this opportunity. While working in QuoteWerks, you can easily launch the contact, opportunity, or quote that you are working with. 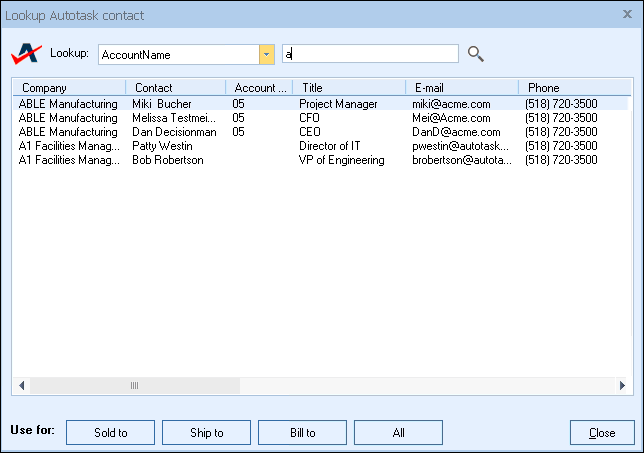 You can launch the contact anytime in Autotask from the Sold To/Ship To tab in QuoteWerks. While updating an existing Autotask Opportunity or Quote, you can easily view them in Autotask with a click of a button ensuring you have a seamless integration with Autotask.